This volume is based on the presentations and discussions of a national symposium on "Couples in Conflict" that focused on family issues. A common thread throughout is that constructive conflict and negotiation are beneficial for relationships. Together, the chapters provide a foundation for thinking about creative ways in which our society can work to prevent or minimize destructive couple conflict and to enhance couples' abilities to constructively handle their differences. *outlines the issue of policies and programs that address couple conflict. This book concludes with an essay that pulls these four themes together and points to new directions for research and program efforts. Contents: Preface. Part I: What Are the Societal and Bioevolutionary Underpinnings of Couple Conflict? M. Wilson, M. Daly, The Evolutionary Psychology of Couple Conflict in Registered Versus de Facto Marital Unions. J. Belsky, Marital Violence in Evolutionary Perspective. F.K. Goldscheider, Men's Changing Family Relationships. R.L. Repetti, Searching for the Roots of Marital Conflict in Uxoricides and Uxorious Husbands. Part II: What Are the Interpersonal Roots of Couple Conflict? What Are the Consequences for Individuals and Couples? T. Bradbury, R. Rogge, E. Lawrence, Reconsidering the Role of Conflict in Marriage. S.R.H. Beach, Expanding the Study of Dyadic Conflict: The Potential Role of Self-Evaluation Maintenance Processes. M.P. Johnson, Conflict and Control: Images of Symmetry and Asymmetry in Domestic Violence. J.V. Cordova, Broadening the Scope of Couples Research: Pragmatics and Prevention. Part III: What Effect Does Couple Conflict Have on Children? How Do Individual Differences in Children Moderate These Effects? E.M. Cummings, M.C. Goeke-Morey, L.M. Papp, Couple Conflict, Children, and Families: It's Not Just You and Me, Babe. C.M. Buchanan, R. Waizenhofer, The Impact of Interparental Conflict on Adolescent Children: Considerations of Family Systems and Family Structure. R.D. Conger, Understanding Child and Adolescent Response to Caregiver Conflict: Some Observations on Context, Process, and Method. J.H. Grych, Increasing Precision in the Study of Interparental Conflict and Child Adjustment. Part IV: What Policies and Programs Influence Couple Conflict? What Works? What Doesn't Work? Where Do We Go From Here? M.R. Sanders, Helping Families Change: From Clinical Interventions to Population-Based Strategies. R.J. Gelles, The Challenge of Changing Couples. T. Ooms, Policy Responses to Couple Conflict and Domestic Violence: A Framework for Discussion. R.E. Emery, Behavioral Family Intervention: Less "Behavior" and More "Family." C. Knoester, T.L. Afifi, Reviewing Couples in Conflict. "...it is clear that the authors wish to provide broad perspectives on conflict in marriage. They have definitely accomplished this goal....Couples in Conflict is an excellent resource for any serious marital researcher." 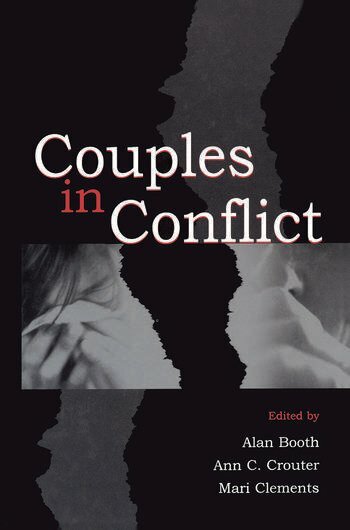 "...the chapters are concise and well-written, and feature extensive references....I would recommend it for graduate students, couple and family therapists, and family reseachers and educators as an up-to-date and thorough resource on couples and conflict."